Try this simple tuna salad on toasted whole wheat bread for a quick filling lunch or on your favorite crackers for a light snack. In a small mixer bowl, combine all the ingredients until well blended. 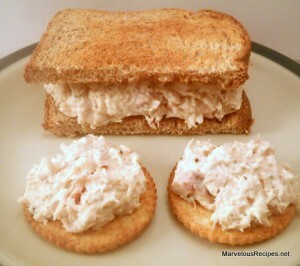 Serve on toasted whole wheat bread or your favorite crackers. Makes 2 cups. * You may omit the celery seed and add 2 tablespoons chopped celery, if desired.